People protest outside as the 9th U.S. Circuit Court of Appeals prepares to hear arguments on President Trump’s revised travel ban in Seattle on Monday. 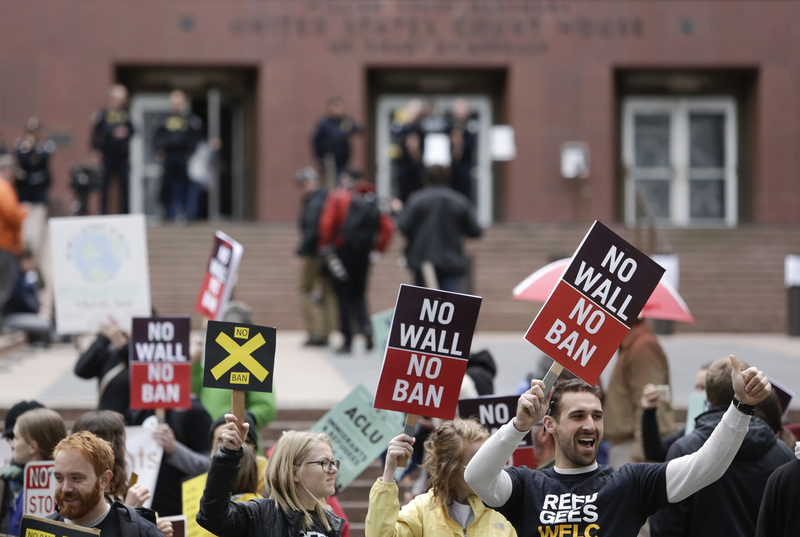 At a Seattle courtroom on Monday, in the latest battle in the legal war over President Trump’s currently suspended travel ban, lawyers and judges pushed and pulled on the swirling questions over Trump’s intentions and the legal limits on executive power. The arguments were carried live on some cable news channels. As the debate unfolded, supporters of immigrants and refugees rallied outside the Seattle courthouse, chanting and carrying “No Ban, No Wall” signs, The Associated Press reports. There are multiple lawsuits pending against the order; 13 judges with the 4th U.S. Circuit Court of Appeals recently heard arguments over a different suit against the order. In Seattle, the three judges — all appointed by Bill Clinton — threw questions at acting Solicitor General Jeffrey Wall, representing the federal government, and at Neal Katyal, himself a former acting solicitor general who is now representing Hawaii. Judge Richard Paez asked Wall what separates Trump’s executive order from the World War II-era mass imprisonment of Japanese-Americans, which was also initiated by an executive order from President Roosevelt and justified on national security grounds. That executive order was upheld by the U.S. Supreme Court at the time. It’s now nearly universally recognized as being unconstitutional and profoundly unjust, born of “race prejudice, war hysteria and a failure of political leadership,” as a congressional apology put it. Wall said that internment then, and the travel ban now, are absolutely different — and that he wouldn’t be defending the executive order otherwise. But he also said he hasn’t read the text of Roosevelt’s order. Wall said the president has clarified his remarks. The judges on the panel pressed Katyal about arguments he had made before the court back when he was responsible for representing the federal government. They pointed out that he argued the president has broad authority when it comes to immigration. “Katyal said he stands by those arguments, but that doesn’t mean the president’s authority is unbounded,” the AP reports. “In closing, both lawyers say the case has big implications for future POTUS decisions — but disagree on what those are,” reports NPR’s Joel Rose, who was in the courtroom. It’s not clear when the judges will rule. It’s widely expected that one of the pending lawsuits will, eventually, be appealed to the Supreme Court.